Bullet Art -- "Her 12 O'Clock"
This is an amazing piece of art, designed and created by Dr. Gril Adler, Chief Interventional Radiology, and currently Air Force Active Reserves. 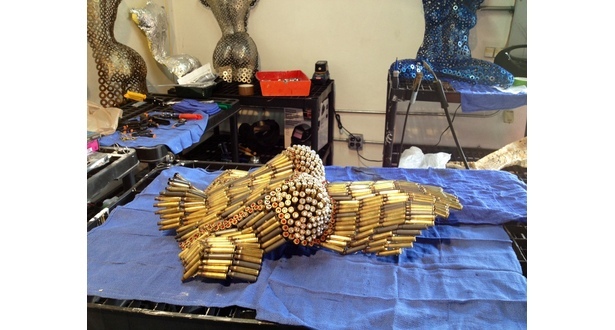 The 223 and 9mm shell casings used to create this masterpiece come from actual SOF training exercises and the SOF "Shooters Course." This heavy-duty piece is built to last and sits on a fiberglass backing. A replica is currently on display at Mad Monkey in Tampa, Florida.